Poster of Hydrogen Sulfide project, 2014. Frequently, environmental contamination is accounted for and communicated numerically. Participants are told they are exposed to 3 ppm of a gas, or contain 4 ppm of BPA in their blood. Yet environmental hazards are experienced through embodiment; the rotten egg smell of hydrogen sulfide, one of the leading causes of workplace injury in the US, is a quintessential example. 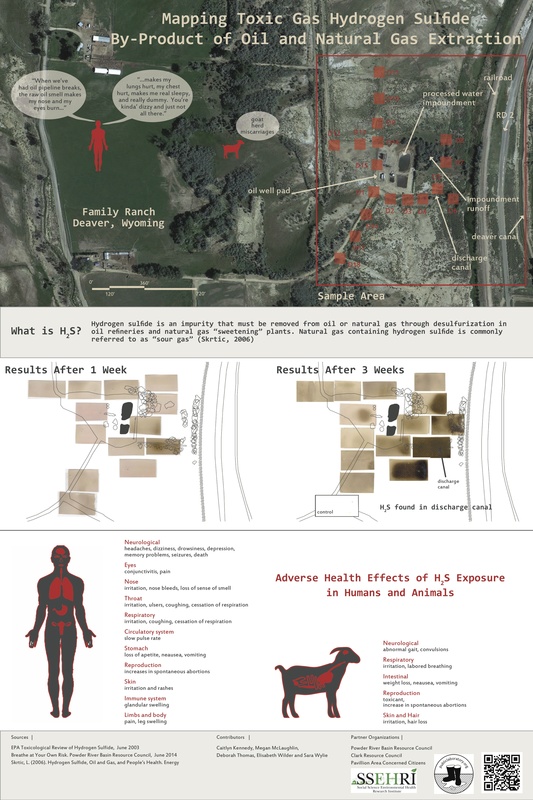 Those living near a source of this gas recognize and have an embodied experience of this contamination but that experience is tied to the location of the exposure and cannot travel to be experienced by regulators or scientists. Research within STS shows how contemporary scientific culture favors visual representation. How does the reception and perception of this hazard change if the risk can be visualized? Working with a low cost, open-source tool we developed through Public Lab, we are studying how a community’s ability to communicate this risk is changed by making it visible. We employ photographic paper that tarnishes with exposure to H2S to map sources of the gas. We are ethnographically tracking how communities use these “data rich” images in their advocacy. Detail of sensing paper over map of area, 2014. Research on this project has been supported by the JPB Foundation Environmental Health Fellowship through Harvard’s TH Chan School of Public Health as well as small research grant from the American Anthropology Association Environment Section and Northeastern University College of Social Science and Humanities see grant funding.